Don Meredith, an all-pro quarterback who made his greatest impact on the game after he finished playing, died Sunday at a Santa Fe, New Mexico, hospital, according to a spokesman. Meredith, above at center, was 72. 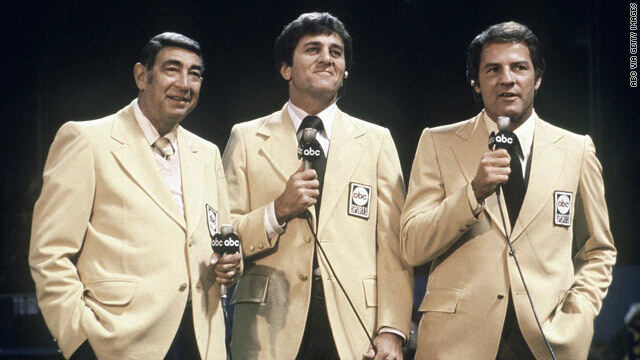 But in a then-unprecedented three-man broadcast booth, Meredith and Howard Cosell - joined by Keith Jackson the first year and Frank Gifford (above at right) after that - created a broadcast unlike any other. Cosell (above at left), a former New York lawyer, and Meredith, the Cowboy from Texas, provided commentary and entertainment that attracted football and non-football fans alike. Their success was chronicled in the 1988 book "Monday Night Mayhem." Before entering the broadcast booth, Meredith played college football for Southern Methodist University and eight years for the Dallas Cowboys. He made three Pro Bowls and was the league's player of the year in 1966. ESPN plans to run a tribute to Meredith and an interview with Meredith’s longtime announcing partner Frank Gifford at halftime of tonight’s Monday Night Football game between the New York Jets and New England Patriots. Dallas Cowboys owner Jerry Jones issued a statement on his passing in which he called him a "Dallas Cowboys original." "His wit, charm, and strength of personality were matched only by his wonderful leadership, toughness and athletic skill. His persona defined the Cowboys of the 1960s and set the course for what the franchise became. Throughout 50 years of history, the Cowboys legacy has been built by dynamic and colorful personalities who could also compete at the highest level. No one fit that description better than Don Meredith," he said. Jones also acknowledged and praised Meredith's transition to his legendary broadcast career. "After guiding this team from expansion franchise to title contender, his charismatic style helped build Monday Night Football to a level of popularity that was unprecedented for sports television in America," Jones said in the statement. "Few men have contributed, both on the field and as a broadcaster, to the impact that the NFL currently has on our country today more than Don. Awesome issues here. I am very satisfied to look your post. Thanks a lot and I'm taking a look ahead to contact you. Will you kindly drop me a e-mail? Great goods from you, man. I've take note your stuff previous to and you are just extremely fantastic. I actually like what you have got right here, really like what you are stating and the way in which during which you say it. You're making it entertaining and you continue to care for to keep it sensible. I can not wait to learn much more from you. This is actually a terrific website.